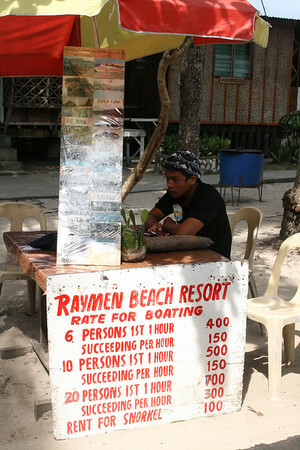 People who may be wondering where to stay in Guimaras are usually referred to Raymen Beach Resort. 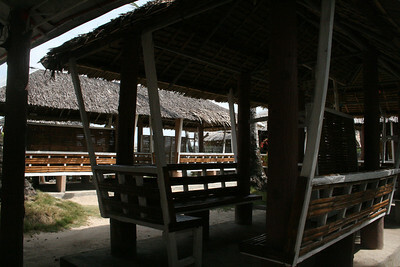 After all, the resort enjoys one (if not THE) of the finest white sand beaches in the whole of Guimaras. Raymen Beach Resort shares Alubihod Beach with two other resorts (but weirdly enough, you seldom hear mention of the other two) and offers cottages (for day trippers), fan rooms (in huts that, unfortunately turned me off as someone travelling with young kids) and air-conditioned rooms. We stayed in their family room that is good for 4 pax (kids 12 years and below are without charge, provided they share beds with the adult) that had TV and hot shower. 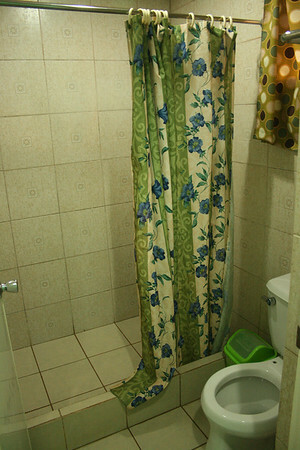 It cost P2,200 per night. Raymen Beach Resort is about 45 minutes to an hour away from Jordan wharf via tricycle or multicab. As of March 14-16 (dates we were there), one-way tricyle fare was P250 and P450 for multicab. I have seen some pictures of the resort in my research but I forewarned my family that it's going to be a resort in an island so they shouldn't expect much. However, we actually loved it there. The room was nice and clean enough. We actually didn't have complaints apart from the issue we had with the air-conditioner located at bed-level (and thus freezing whoever is sleeping nearest it). Sure, I did hang the sign asking them to clean our room and that wasn't done, but it was also no biggie for us to just borrow a broom and sweep the sand and crumbs my darling sons keep bringing in. I figured, if my sons refuse to wash their feet properly before entering our room (as politely asked by a sign before you enter the building), then it shouldn't be a problem that I end up sweeping after them. The room we stayed in was the one on the first floor, immediately after the reception desk. Now, the restaurant was a total surprise for us because we didn't expect it to offer good food. 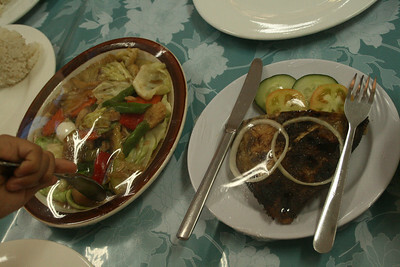 The pancit bihon and chopsuey were so good, we had them twice. 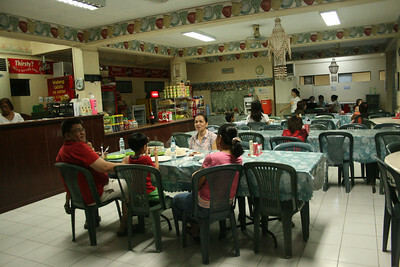 They also offer sandwiches, Filipino and Continental breakfasts and other dishes. Food was really good to great... you just have to generally order ahead of time (even heating up piaya you buy from their consignment kiosk takes some time). Hot water is charged (P3) but coffee or hot chocolate comes free with the breakfast meals. Their wait staff are friendly too... one even babysat my youngest so we could eat in peace. 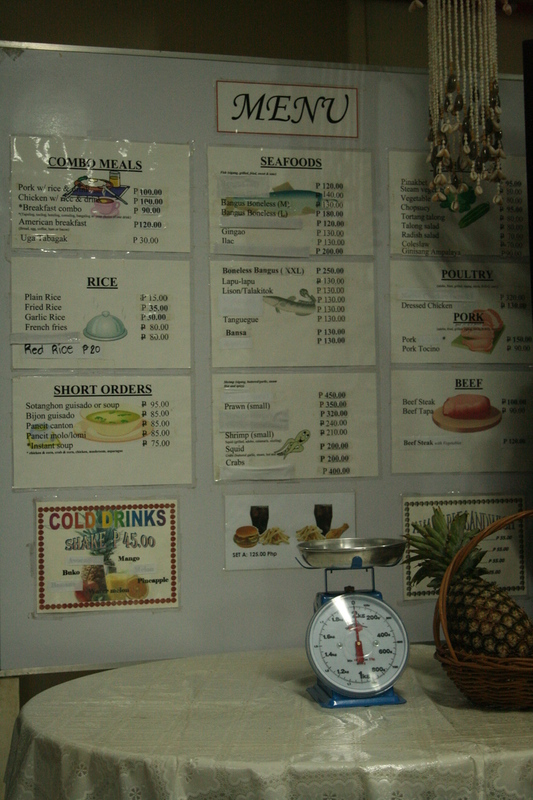 For an idea of the price range of the dishes served at their restaurant, click here. Generally, we paid between P500-700 per meal we ate there (but we were 4 adults and 2 kids who eat enough, not just pick-and-peck on their food). Now, if you want cheaper fare, just outside the resort is a line of carinderias/provincial barrio bars. 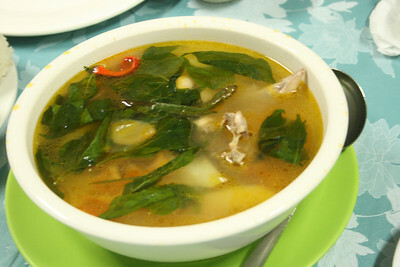 We enjoyed the batchoy (P30) offered at JM Carinderia (the farthest of the lot) so we dined there one night. 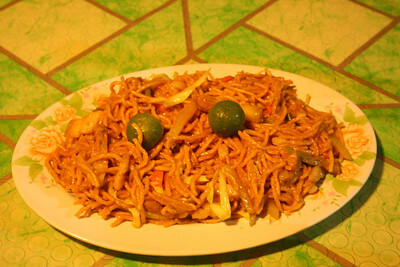 Their pancit canton looked weird but tasted really good (albeit a little salty for my palate). 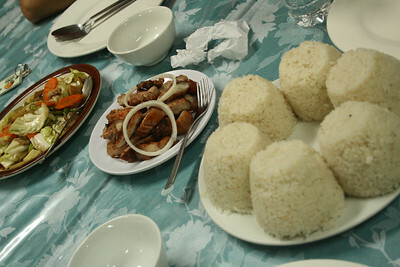 Their sinigang was good too, the chicken barbecue was a little bland. My son ejoyed their mango shake. 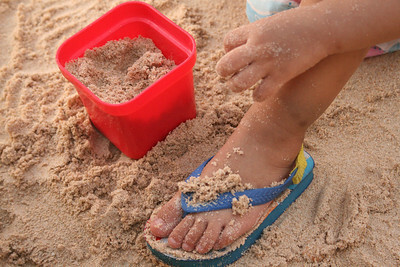 For those travelling with young kids, I really consider the resort ideal since the kids can just play in the sand. Phone reception is best at the beach too... so my husband was able to take conference calls. At night, we could walk the length of the uncluttered beach and feel safe. In short, Raymen Beach Resort is highly-recommended for those who want an island experience without completely going off the grid (as is the case in other resorts In Guimaras). They do say that it can get quite crowded at Raymen when during weekends or peak season (someone told hubs, all you can see are heads in the water, haha). We were there on weekdays so that must have contributed to our great experience. Entrance fee for adult is P25, child is P10. Corkage for food is P30/head and drinks P100/case and electricity/appliance charge is P120. 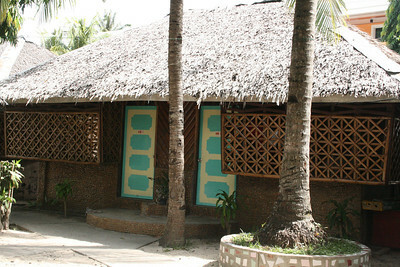 Cottages start at P500. Andrea... in case it didn't occur to you, we were also just guests at Raymen Beach Resort. I am a blogger, this is not their website. Please read my blog post again and either contact Raymen or do your own cestimations based on the rates/costs I have provided. 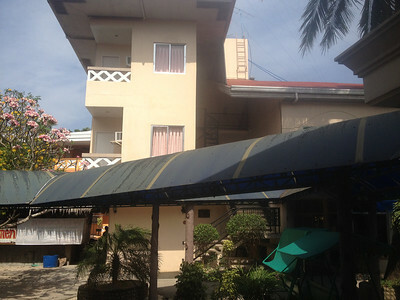 I really impressed with your post because it is very detail about Raymen Beach resort. Thanks for the share. How I wish I will also visit this place. Is bringing food inside the resort is allowed like noodles, canned goods and drinks? Thanks for sharing this detailed review of Raymens' Beach resort. 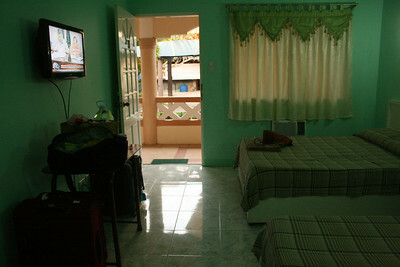 I've been eying this place to stay when we visit Guimaras. Our bags weren't checked for food and drinks and we weren't charged any corkage fee for those things we ate that we didn't get from there... but we were charged for hot water (for soups and hot chocolate) and having viands reheated (those we didn't order from the restaurant). Since you mentioned there are two other resorts on Alubihod beach, any idea how much (price range) those other two cost? Or will I be better off staying at Raymen? Thanks. Thanks Mec. 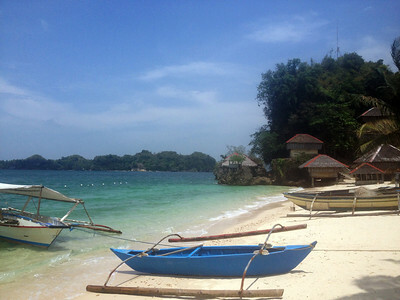 One last question, what's the best beach in Guimaras? Is it Alubihod? HI Mec!!! i will be visiting your blog! =====THANK YOU GUYS!!!! YOU ROCK! Hi Mec! I am visiting Guimaras and Iloilo in August and your hotel review is just so helpful. Thank you. Hi mec, this blog is very helpful, it really helps a lot to plan my guimaras adventure this august.i just wanna ask if they are offering an internet connection. If not what mobile network provider does have strongly signal in the resort? Thanks in advance. Thank for this blog. We posted it in our official website. www.raymenresort.com. The Guimaras Pride! 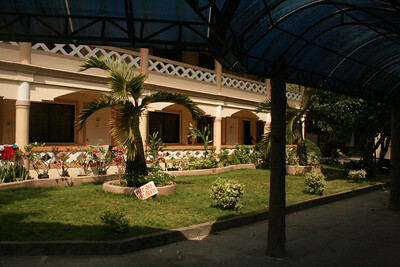 Visit our Official Website www.raymenresort.com.